Here I go again with another post about muffins. What can I say, I’m a muffin baking fiend! This was my second baking experiment in my beautiful new oven (hello gas range, I love you). My first experiment was a late night batch of oatmeal chocolate chip cookies that were devoured entirely too quickly to even blog about. But they did teach me that my oven actually holds the temperature I set it at. I can’t even begin to tell you how this excites me. Enough to need to bake muffins, that’s for sure! When I moved, I discovered a forgotten can of pureed pumpkin in my pantry, and decide it was time to put it to good use. It helps that I know the boyfriend loves all things pumpkin. Looking at what else I had on hand, I decided to break into the brand new bag of coconut, and mix in some pecans for crunch. Knowing they might look a little plain jane as is, I also added a coconut pecan crumble to the top. 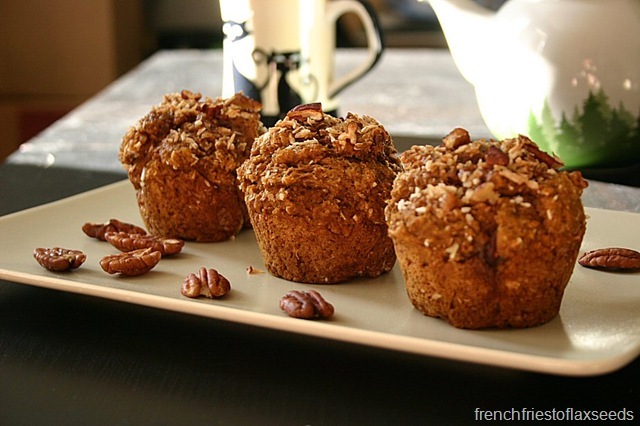 It proved to be the right amount of sweetness to make these muffins seem like a treat when in reality they don’t have much added sugar. Plus they just look pretty! We both enjoyed these throughout the week – they made a great fast breakfast with some yogurt and fruit, and were the perfect mid afternoon snack to keep me going through that 2 pm lull while I plugged away on the computer. 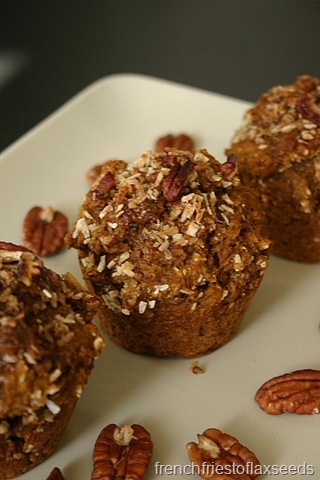 A rough nutritional analysis of these muffins shows they provide about 5 g of fibre and only 1.7 g of sugar per muffin, plus a whole whack of Vitamin A (you can thank the pumpkin for that), manganese, and a fair amount of Vitamin C, all for around 200 kcal. Nice! Dig out that can of pureed pumpkin hiding in the back of your cupboard and bake up a batch of these pretty orange-hued muffins. They are a great way to start your day, served up with some yogurt and fruit, and make an awesome afternoon snack. 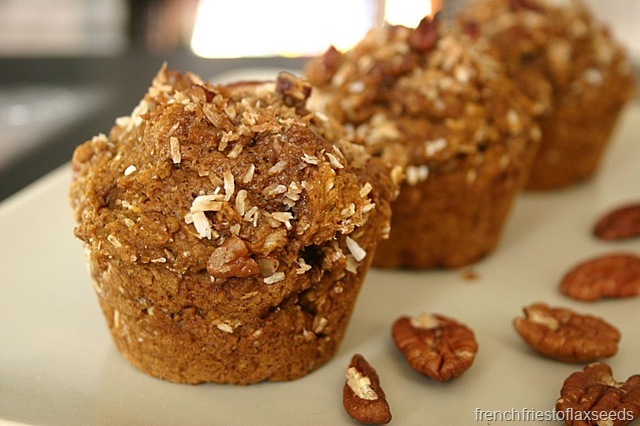 Low in sugar, high in fibre, and oh yeah, they taste good too! 1. Preheat oven to 375 degrees F. Spray/grease a muffin tin, or use paper liners. 2. Combine flour, 1/2 c sugar, 1/3 c coconut, 1/3 c pecans, baking powder, baking soda, cinnamon, nutmeg, and salt in a large bowl. Set aside. 3. 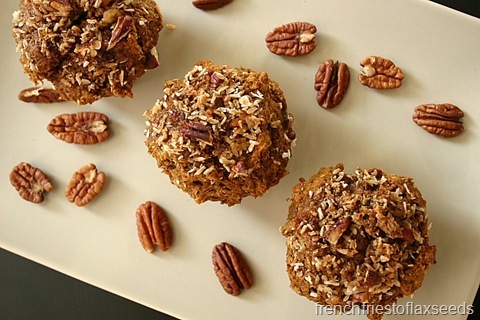 Combine remaining sugar, coconut, and pecans in a small bowl and set aside for topping. 4. Combine pumpkin, egg, milk, coconut oil, molasses, and vanilla in a medium bowl, mixing thoroughly. 5. Add the wet ingredients to the dry ingredients, as well as the cranberries. Mix until just combined (some lumps are okay). 6. Divide the batter evenly between 12 muffin cups. Sprinkled coconut pecan topping on each muffin. 6. Bake for 20 – 25 min, until golden brown. Note: You can easily substitute the coconut oil for melted butter or another oil. I added the molasses on a whim, to add a depth of flavour and colour. If you don’t have any, leave it out. I considered not posting this recipe today given the horrific events at the Boston Marathon yesterday, but felt that even though what happened was horrible and tragic, life does still go on. Of course my thoughts go out to everyone affected. Such a senseless act at such a positive, inspiring, non-political event. OH. EM. GEE! 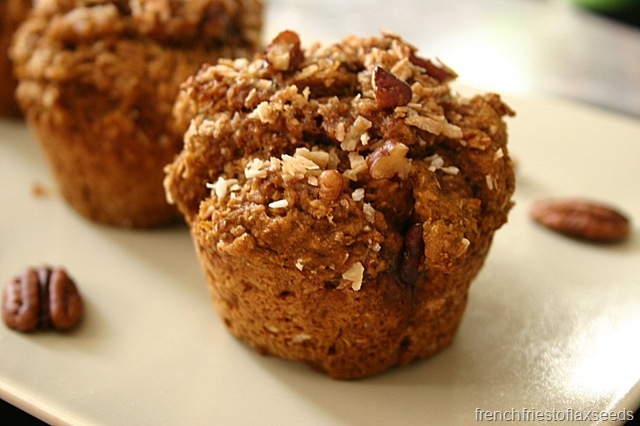 These muffins are right up my alley! 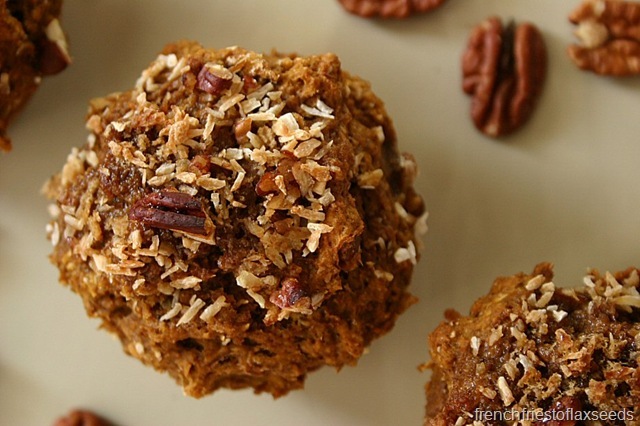 Coconut, pecans AND pumpkin? I need to find some time to bake a batch! Thanks for posting, Marianne…. They were pretty darn good. And boyfriend approved! Made these without pecans (nut allergy), canola instead of coconut oil, soy milk, and flax + water instead of the egg… And they’re awesome!! Nice and dense, perfectly sweet. And good call on the molasses! I’m glad you and the family liked them! You’ve reminded me that I need more pumpkin! I’ve been without it for a while, but I refuse to reserve it for the autumn/holiday season. These look delicious! these look amazinggggg. love your plate photo as well with the sprinkling of nuts!